A dog allergy treatment plan that really works, is one that includes boosting your dog's immune system. 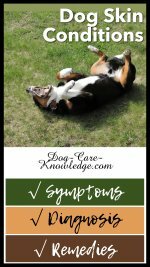 You can, and should, work on treating the symptoms as well, mainly itching, but if you actively improve your dog's immune system, it will lessen the symptoms in your dog. Here's why. Dogs that suffer from allergies have an immune system that has gone awry in some form or another. Usually by over-reacting to something in the environment or diet. Simply by improving your dog's immune system you can help your dog heal from the inside out. I know this for sure because that's what I've spent the last year doing with my dog Ava, who has multiple allergies but now has a 75% reduction of symptoms. That's what I call results and here's how we did that. The first and easiest way, is to ensure they have the required nutrients in their body that help with the skin and coat. The main culprit for itchy skin in dogs is simply a lack of omega-3 and 6 essential fatty acids (EFAs). Dogs require EFAs for their well-being but cannot produce EFAs themselves, they need to get them from their diet. This is why they're 'essential'. Many commercial dog foods contain high levels of omega 6 but very low levels of omega 3. Omega 3 is primarily found in fish. Supplementing your dog's diet with essential fatty acids (EFAs), Omega-3 in particular, will go a long way to boosting your dog's immune system naturally, which in turn will reduce your dog's reaction to allergens. Salmon oil has an abundant supply of Omega-3 EFAs and is a great supplement to add to your dog's diet. Click here for more information on the benefits of salmon oil for dogs. Pawsome Naturals Wild Alaskan Salmon Oil is derived from the purest sources of Omega-3 available. Manufactured in the USA using only wild (not farm-raised) salmon straight from the pure, clean waters of Alaska. Containing vitamin E that acts as a natural preservative. The air-tight container is sealed for freshness and includes a pump-top to deliver the oil straight to your dog's food without spillage. The next method of improving your dog's immune system takes a bit longer but is the closest thing to a cure for allergies for your dog. After spending four years treating my dog's allergy symptoms, I finally decided to go to a Veterinary Dermatologist who conducted skin tests to determine what Ava was allergic to. I detail that journey here, but bottom line, I decided to try the immunology treatment which involved formulating a specific allergy shot that I give to her once every three weeks. If you're a bit squeamish with injections, you can give the treatment orally instead, it'll just be more frequent. Over the last year Ava's symptoms have been improving gradually. This is the first allergy season I've gotten through without any visits to the vets for allergies. For us, that's huge! We used to go about five or six times a year, usually because her ears become infected and require ear drops. That has totally stopped, her scratching and paw chewing is minimal and her coat is soft and shiny. I highly recommend the immunology treatment, again, you can see how my dog got on with it here and if you want to find a Veterinary Dermatologist near you click here. Or, if you're not keen on the skin testing, there is a standardized immunology treatment that was developed by a veterinarian known as RESPIT, which doesn't require skin testing and is also available in injection of oral form. Both the immunology treatment options help calm and improve the immune system but they do take time to work. Improvement is usually seen after three months but maximum benefit doesn't occur until about one year. But it's well worth the wait. There are now two in-home allergy tests that you can conduct to determine what your dog is allergic to. Nutriscan is a saliva test that tests for 24 common foods. Home Allergy Test Kit For Pets is a hair test which tests for over 600 allergens; 300 foods and 300 environmental factors. Finding the right dog allergy treatment plan is key to relieving your dog of their allergy symptoms. If you are unsure whether or not your dog's itching is due to an allergy you can review the symptoms and other dog skin conditions by clicking on the relevant image directly below here. If you choose not to do the immunology treatment, you can use the below methods for as long as you want. WARNING - if your dog's face is puffy or swollen, SEEK IMMEDIATE VET CARE NOW. This is a symptom of a potentially life-threatening allergic reaction. If it is out of normal veterinary hours then call an emergency veterinary clinic. Do not wait until your vet is open to address this serious issue. A flea allergy doesn't mean your dog is riddled with fleas, it means he is hypersensitive to the saliva of fleas. Not all dogs bitten by fleas have a flea allergy, but a dog with a flea allergy is likely to react to just one flea bite. It will cause severe itching and scratching. You can check your dog for fleas by standing him over a white sheet and brushing the coat with a flea comb, specially at the base of the tail. If your dog has fleas, you'll see white and black sandy grains fall onto the sheet. He doesn't need to be infested with fleas to suffer from the effects of one flea bite though, he could equally have been bitten by a flea that has long departed! But it's good to check to make sure there aren't others on him. Start by supplementing with wild Alaskan salmon oil. Twice weekly medicated baths to clear the skin. I'd recommend Hypo Aloe Genic shampoo as its very mild and can be used frequently. Anti-itch spray to calm the itching. I like Wham Anti-itch spray by Nature's Specialties. Corticosteroid tablets (from vets) again to stop the itching. Antibiotics (from vet), if skin infections are present. Pawsome Naturals is also available via Amazon Prime with free 2-day shipping. Flea allergies can usually be successfully treated at home without the need for a vet visit. However, if skin infections are present, then you should visit your vet to prescribe antibiotics. Inhalant allergies, also known as Atopic Dermatitis affect about 10% of the dog population. 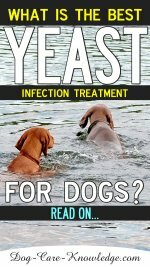 The very best treatment plan for these dogs is to eliminate anything the dog is allergic to from his environment. If its outdoor pollens (usually seen in spring/summer) then wiping your dog down with a damp towel or medicated wipe when she comes in from outside is a good starting point. Now, if you're coughing and spluttering after reading those words, I don't blame you, avoiding contact with most allergens is almost impossible if not downright awkward. I get it, my dog is allergic to humans, so avoiding me is not going to happen...ever! That's why I choose to try the immunology treatment (allergy shots) which I highly recommend for an inhalant allergy! Start by supplementing with essential fatty acids (especially Omega-3). I like wild Alaskan salmon oil. Weekly baths with a gentle shampoo. I recommend Nature's Specialties Hypo Aloe-Genic by Nature's Specialties. 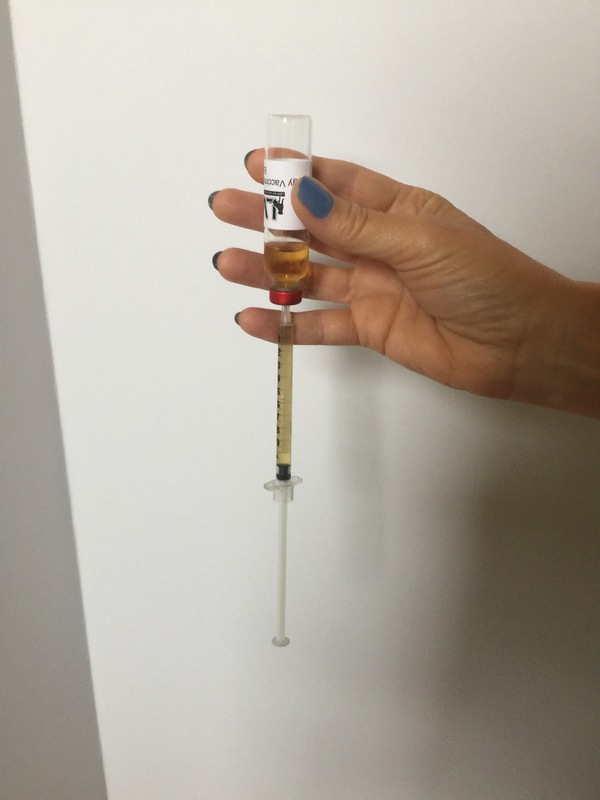 Corticosteroid injection or tablets may be prescribed by a vet in very severe cases, but this should be used in moderation, and ONLY short-term. Not all dogs react to the same medicine equally, so choose one and see how your dog responds. Just don't use all three at once! WARNING: only give Antihistimines that has Diphenhydramie, Ceterizine or Loratidine as the ONLY active ingredient. Don't give dogs an allergy medicine that has a 'D' on the package i.e. Claritin-D or Benadryl-D. The 'D' stands for decongestant and dogs must not have decongestants. Any kind of Decongestant, or Benadryl for Colds, etc., are unacceptable. Dogs under 10lbs = half of a 10mg tablet once daily. Dogs over 10lbs = 1 x 10mg table once daily. e.g. a 75lb dog would get 9 capsules a day (3 x25mg capsules three times daily. Treated early, the condition should not progress beyond this stage. Remember, only use shampoos specially made for dogs. Preferably a natural and gentle one, if your dog has allergies, the last thing you want to do is add more chemicals to his skin. In some cases, however, and if left untreated, the condition can get much worse with dogs developing reactions to more and more allergens which causes the allergy symptoms to escalate and last year long. Dogs that experience this can develop deep scratches, skin infections, ear infections and become extremely miserable. Dog skin allergies of this nature need to be managed and controlled as early as possible preferably with an allergy vaccine. Inhalant allergies can be managed at home but it is advisable to check with your vet first, as they do have a tendency to get worse if left untreated. The good news is that inhalant allergies respond very well to allergy vaccines. 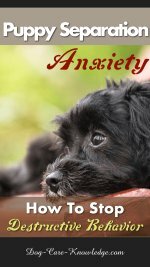 See here for Food Allergy Symptoms The only treatment for a dog with food allergies, intolerances or sensitivities, is removing the food causing the problems completely from your dog's diet. 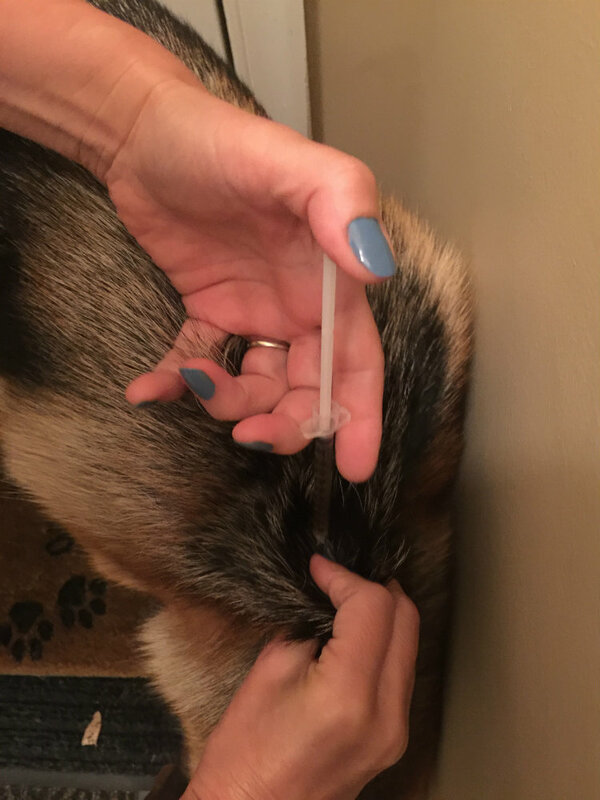 Finding the problem foods can be difficult which is why I recommend using either Home Allergy Test Kit for Dogs or Dr. Dodds' NutriScan Food Intolerance Test for Dogs. See here for more on canine food allergies in general. A contact allergy is one of the easiest dog skin allergies to treat, as long as you can remove the cause from your dog's environment. 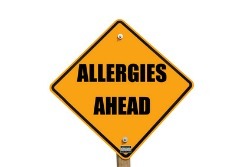 Of course, the difficult bit is getting to the bottom of what's causing the contact allergy! Try thinking of anything you've just started using. Maybe on the floor where your dog lies, new air fresheners, new shampoo or other spray on your dog, new bedding, or maybe you've just had the carpets cleaned (that's a common cause). Basically, put your thinking cap on and try and think of anything new your dog has come into contact with. 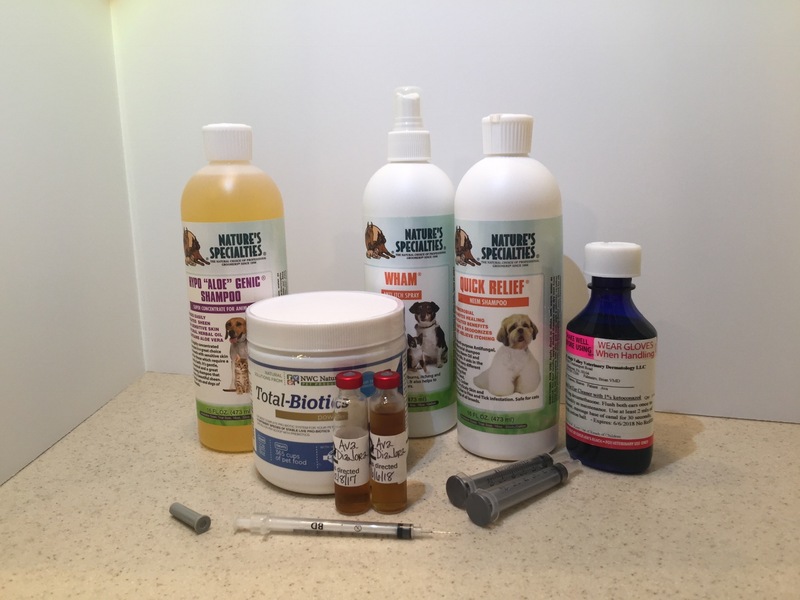 I do hope you can relieve your dog's itching by following these dog allergy treatments, but, if you find that your dog is still suffering from symptoms, then check out other causes of dog skin conditions. If this still doesn't help then definitely book a vet's appointment. 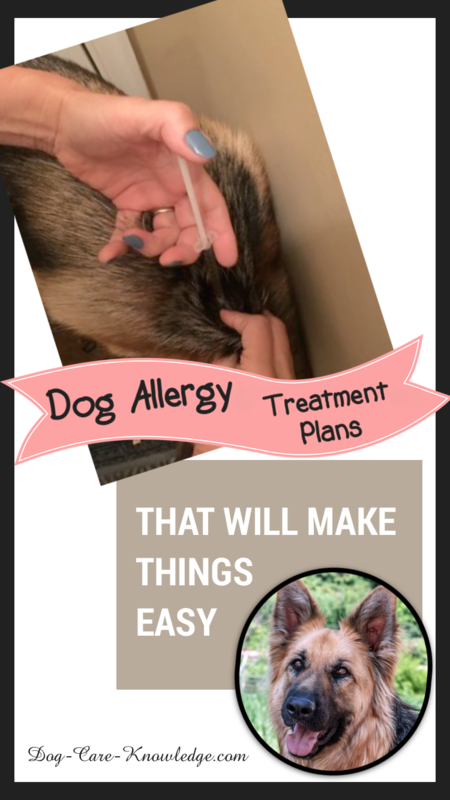 Just remember to make a note of all the symptoms and details of any dog allergy treatment you've tried so far. See flea and tick control for more information on control and prevention for a flea allergy. See Dog Skin Conditions for specific questions you need to make a note of.